QUESTION: Today i got my report; in that report fasting blood sugar result is 98 and then 1 st hour blood sugar result is 167, then 2nd hour blood sugar result is 142. That is the result. My question is I have a sugar if in case it is their what i have to do? it is consider as a diabetes? 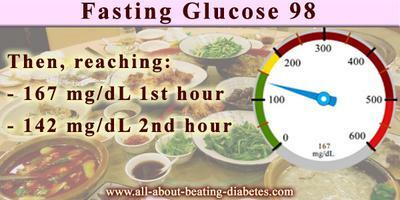 Your fasting blood glucose is normal to my judgement; while you have some problems regarding the results of oral glucose tolerance test you did, and showed a blood sugar of 167 after 1 hour and 142 after 2 hours. You are asking if it is called diabetes or not. The answer depends not only on the results of your lab test, but, also on your medical history. In other words I want to know if you are experiencing any of the symptoms of diabetes (i.e. frequent urination, being thirsty although you drink a lot, etc). In case you have some of the symptoms, and your OGTT is 142 (after 2 hours), in general, it is considered as pre-diabetes. In other words, diabetes is not set yet, but you are one step before its onset. Therefore, if you follow the right lifestyle and diet changes, you can manage to get your blood sugar back to normal and will prevent the onset of diabetes. In case you do not have any symptoms of diabetes, then, still you can consider yourself as a pre-diabetic; but, have less chances to develop diabetes than in case you had the signs. At the end, I want to emphasize that you can consider yourself as a pre-diabetic; however, my judgement is based only on your saying without have any detail on your personal medical history. Be persistent with the health changes you follow in order to avoid diabetes, and live a healthier life. All the best! QUESTION: I HAVE MADE MY FULL HEALTH CHECK ON 09.10.12.ALL FOUND TO BE NORMAL./BUT I HAVE SOME DOUBT REGARDING MY BLOOD SUGAR. FASING IS 98 AND PP IS 170. IS IT OK OR I HAVE TO DO SOMETHING TO GET IT NORMAL. What I can see from your medical test report, everything seems to be ok. Hope you will continue always like this. With regards to your concern, I would say that it is ok that your acceptable post-prandial blood sugar are under 180 while the normal levels should be less than 140. Therefore, I recommend to watch what you are eating. Try to stay away from high-carb, high fatty foods, and consume more fruits, vegetables, nuts, etc.